Now this is a next-generation record player done right. 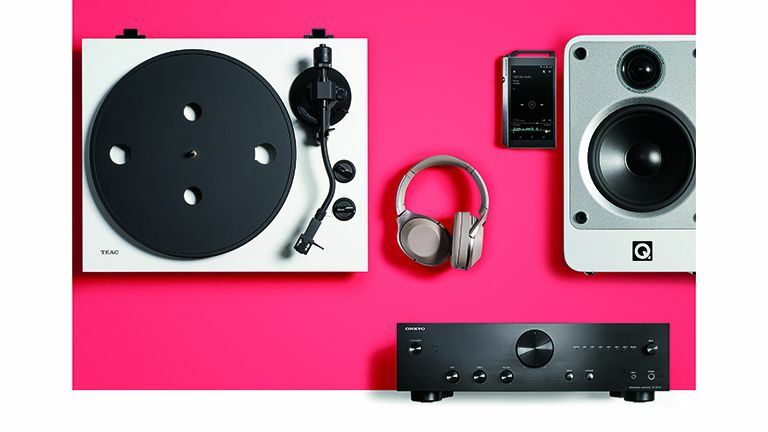 Not only does it look the business (the Teac TN-400BT is available in four finishes, including ravishing red and retro walnut), it also has aptX Bluetooth built-in, enabling vinyl to be streamed directly to your Bluetooth headphones. There’s also a handy 16-bit/48kHz USB digital output to rip discs. Performance-friendly features include a low-resistance spindle to minimise friction and ensure a stable rotational speed, plus a subsonic filter to combat annoying bass wobble from warped records. A built-in phono EQ amp enables the turntable to be partnered to any audio system, even those without a phono input. If you plan on digitising your vinyls (read the boxout on the opposite page for our software tip), you’ll want a dedicated digital audio player to keep those 16-bit files with you. Pioneer’s gorgeously made, Android-based digital audio player is the perfect way to enjoy the sweet sound of needle drops on the move. There’s 32GB of storage available, expandable via two SD card slots. Supported music streaming services include Tidal, Deezer and Spotify. Wireless Bluetooth headphones have been elevated to audiophile status with Sony’s sleek MDR-1000X. There’s some clever functionality to match their supreme comfort, too. When you cup the right earpad (therefore activating Quick Attention mode), music is muted so that you can hear what’s happening around you without the hassle of having to remove your headphones first. Incorporating a robust ‘cabinet within a cabinet’ Gelcore design, the Q Acoustics Concept 20 loudspeakers look like no other bookshelf speakers out there. The inner and outer enclosures are held in place by a proprietary adhesive that never quite sets solid. What does this mean? Any energy generated by the drive units within the cabinet is dispersed as heat, preserving the speaker’s sonic integrity. They will make your vinyl sound awesome. A great stereo amp is the heart and soul of any good vinyl system, and we’re big fans of the Onkyo A-9010(UK). With its no-nonsense usability and classic design, this two-channel amp offers outstanding analogue musicality. The fascia offers knobs for volume, input selection and tone control, while the chunky speaker terminals are gold-plated. Finally, beneath the lid a transformer allied to high grade audio components ensures the audio quality is both warm and engaging.